Hendrik "Erik" Dekker (born 21 August 1970) is a retired Dutch professional road racing cyclist active from 1992 until 2006. He was a member of the Rabobank cycling team from 1996 till 2006. In 2007 he became one of Rabobank's team managers. Dekker rode his first race at eight, and soon became successful. In 1985 he was invited to join the national selection for juniors. As an amateur, his most important results were second places at the youth world championships in Bergamo in 1987 and at the road race in the 1992 Summer Olympics. In that Olympic road race, Dekker got away at 30 km before the finish, together with Fabio Casartelli and Dainis Ozols. Dekker was outsprinted by Casartelli, but was so happy that he won a medal that he also finished with his arms in the air. Directly after the Olympic Games, he became professional, and rode his first race a few weeks later in the Tour de l'Avenir. His first win as a professional was a stage of the Tour of the Basque Country of 1994, the year he rode his first Tour de France. In 1997 Dekker won the Ronde van Nederland, but a large part of 1998 was lost because of injuries. In 1999, Dekker was sanctioned for a few weeks because of a too high hemotacrit-level. This meant that he could not start in the World Road Race Championship. The year 2000 was Dekker's best. 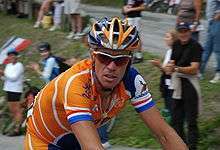 He won three stages in the 2000 Tour de France, although neither a sprinter nor a favourite for the overall win, and was voted most combatitive cyclist. In the autumn of that year, Dekker won his first classic, the Clásica de San Sebastián. In 2001 Dekker won the Amstel Gold Race and the UCI Road World Cup. In the 2001 Tour de France he took a stage, after having helped his team mate Marc Wauters to a stage win. At the end of the year he was named Dutch Sportsman of the year. The years 2002 and 2003 were less successful because of injuries. He came back in 2004 in the spring classics and a victory in Paris–Tours. He had announced his retirement for the autumn of 2006, but he crashed heavily in the 2006 Tour de France and decided to stop. In 2007, Dekker started as team manager of the Rabobank team. ↑ "Erik Dekker Olympic Results". Olympics at Sports-Reference.com. Sports Reference LLC. Retrieved 24 July 2016. 1 2 "Tour de France 2009 – Key Moments – Stage 6". letour.fr. 8 July 2009. Retrieved 8 July 2009.